At Jewlicious we seem to have excelled at creating a real online community. But we’ve always realized that there are limitations to online interaction and we are thus always eager to facilitate real world interaction – you know, like the Jewlicious Festival (duh). With twitter becoming the next big thing, we decided, along with our local crew in Jerusalem, to run a twitter meeting, or tweetup in Jerusalem. So it’s time to party Jerusalem style! If you’re in Israel, come join some of the finest twits in all the land at Bulghourji Lounge and Gardens on Armenian Patriarchate Rd. 6 (Armenian Quarter â€“ Old City) Jerusalem. It’s by the Jaffa Gate just past Migdal David. Really easy to get to (see the video for directions even a Tel Aviver can follow) and you can park for three hours for free at the Mamilla Mall. This tweetup will feature the usual tweetup action – networking with your peers, a geeky vibe – all that stuff, but with a twist! Thanks to the generosity of our sponsors, each attendee will get a free glass of wine (while supplies last) and there will be snack food to munch on fresh from the shuk. Also in attendance will be DJ Babette from Amsterdam to spin cool tunes to help you geek out! All wine served is Kosher as are our sommeliers. The snacks are Badatz and everything will be served in or on plastic. Other than that, get ready to have a great time and stay tuned for further details as they emerge! 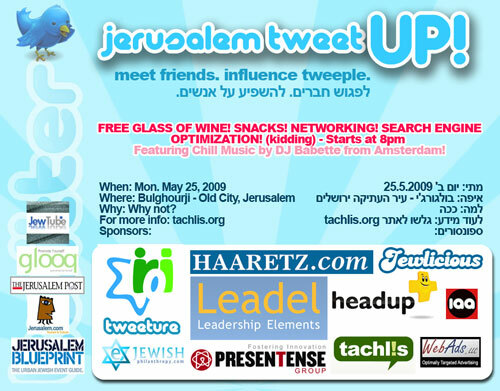 Leadel.net, The ROI Community, Haaretz, JewTube, Headup.com, The Israel Artist Agency, the Jerusalem Post, tweeture, Glooq WebAds, GoJerusalem.com, Jerusalem Blueprint, eJewishPhilanthropy, Presentense, and, of course, your hosts Tachlis Jewlicious. If you have any questions, feel free to email us at info@tachlis.org, RSVP on Facebook (and invite your friends) or catch me on twitter – I’m @jewlicious and I am here to answer all your questions! The snacks are Badatz and everything will be served in or on plastic. Oh, thanks! I was going to ask you about that. Glad that Search Engine Optimization is just kidding! If I get one more follow from an “SEO Expert”…..